What happened to Canadian veterans after the Great War? In the minds of many, shell shock and physical disfigurement loom large. These two images of veterans have attracted so much attention in both academic writings and cultural representations that they have become representative of the entire population of returning ex-servicemen. However, a group of researchers at the Laurier Centre for Military Strategic and Disarmament Studies (LCMSDS) are challenging these pre-conceived notions, and have found, unsurprisingly, that the Canadian veteran experience is more complicated and diverse than many have assumed. In the coming weeks, Active History will feature a series of four blog posts written by these researchers––specifically in regard to how disabled Canadian ex-service people of the Great War engaged the pension system. For all veterans, pension eligibility rested on the principle of “attributability.” Veterans had to prove that their post-war disability was the direct result of an injury incurred while on active service. Initially, they would file an application for a pension and subsequently undergo a medical examination to assess their disability claims. The Board of Pension Commissioners––later renamed the Canadian Pension Commission––would consult this medical report, in tandem with their service records, and rule if the applicant was eligible for a pension. 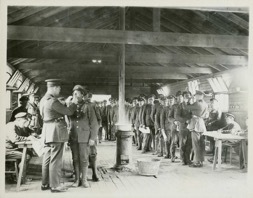 Canadian veterans undergoing health inspections upon demobilization in 1919. Those found ill were held back until they were healthy. Canadian War Museum, George Metcalf Archival Collection, CWM 19940003-473. Despite the uniformity of pension policy, the Canadian veteran community was not. Certainly, there were notable similarities among veterans’ experiences, but the variations were both substantial and significant. Utilizing several historical lenses to explore issues of ethnicity, class, gender and medicine, this series finds that the veteran community of the Great War was both dynamic and diverse. Based on the newly-digitized Veterans Affairs Canada’s First World War pension records, each featured blog post over the next few weeks will speak to the plurality of the Canadian veteran community and its divisions along ethnic, gender, and class lines. They will also draw connections to the present-day challenges of Canadian veterans. Post-traumatic stress disorder (PTSD) remains a concern, with the Department of National Defense releasing a November 2016 report that eighteen members of the Canadian military took their own lives in 2015. As of 2014, women continue to comprise only a small percentage of the Canadian Armed Forces at under fifteen per cent and experience sexual harassment and assault at epidemic rates. And lastly, with the growing popularity of National Aboriginal Veterans Day, Indigenous veterans have grown increasingly disconnected from the larger network of Canadian veterans in response to the distinct challenges they face after coming home. The Board of Pension Commissioners for Great War veterans operated on a strict policy of ‘objectivity.’ This meant that claims based on accomplishment, compassion, or sacrifice rather than demonstrable wartime injuries were ignored. In order to receive a pension, veterans had to prove their post-war injuries were linked to their service in an active theatre of war. If their applications were accepted, veterans’ disabilities would then be assigned a corresponding percentage based on how much the disability impeded a veteran’s ability to perform in the workplace. Although this concept of “attributability” was meant to encourage objectivity on part of those who evaluated applications, it nonetheless remained ambiguous. What were the experiences of Nursing Sisters––who did not conform to the traditional image of a masculine veteran––when applying for pensions? What about Indigenous veterans, particularly those defined in the Indian Act? Which department was responsible for the administration of those Indigenous veterans’ pensions? Or what of those afflicted with non-physiological symptoms that did not fit easily into the defined categories of disability? These questions and others will be explored in this series over the following weeks. The first of the series, written by Kandace Bogaert, will present the case of a psychologically-ill veteran named Dennis R. and investigate the politics of pensions and health in post-war Canada. In the following post, Brittany Dunn looks at ex-officers and the gendered language of self-reliance. Eliza Richardson will then delve into an oft-overlooked group of veterans––Nursing Sisters––and the role they played in challenging gender norms in the aftermath of the war. Eric Story will wrap up the series with a focus on the origins of National Aboriginal Veterans Day and the unequal treatment Indigenous veterans faced when receiving their pensions. By the end of this series, we hope to have demonstrated the diversity of the Canadian veteran community of the Great War, certainly with common experiences, but also unique ones specific to the many identities that existed within this community. Perhaps more importantly though, we also hope to demonstrate the utility of the pension records in which these four posts are based, so that subsequent research can be conducted to further our understandings of the social history of Canada in the first half of the twentieth century. The research for this collection of blog posts was conducted at the Laurier Centre for Military Strategic and Disarmament Studies (LCMSDS) in Waterloo, ON, which was made possible by the generous funding of the Social Sciences and Humanities Research Council (SSHRC). Follow us on Twitter @LCMSDS, or “Like” our Facebook page. You can also visit our website at canadianmilitaryhistory.ca or listen to our new podcast On War & Society on Apple Podcasts, Soundcloud or at canadianmilitaryhistory.ca/events/podcast-2/. David A. Gerber, “Introduction: Finding Disabled Veterans in History,” in Disabled Veterans in History, ed. David A. Gerber (Ann Arbor: University of Michigan Press, 2000), 2. The Board of Pension Commissioners was formed in 1916. It was renamed the Canadian Pension Commission in 1933. Tom Parry, “18 Canadian Forces members took their own lives in 2015, with army members most at risk,” CBC News, November 23, 2016. “Poor Recruiting, sexual harassment obstacles for women in military, says Sudbury veterans,” CBC News, November 30, 2016. Lee Berthiaume, “National Aboriginal Veterans Day continues to grow in size and scope,” The Canadian Press, November 8, 2016. ActiveHistory.ca is featuring this post as part of “Canada’s First World War: A Centennial Series on ActiveHistory.ca”, a multi-year series of regular posts about the history and centennial of the First World War. We continue to seek contributions – contact Nathan Smith at nsmith241@gmail.com.